Local H entered into relatively unchartered musical territory when the group first formed in 1990 in Zion, Illinois. Though started as a four-piece, it quickly whittled down to a duo. At the time, there weren’t many two-pieces around. Still, the hard rockers managed to sign to a major label for their full-length debut, 1995’s Ham Fisted. 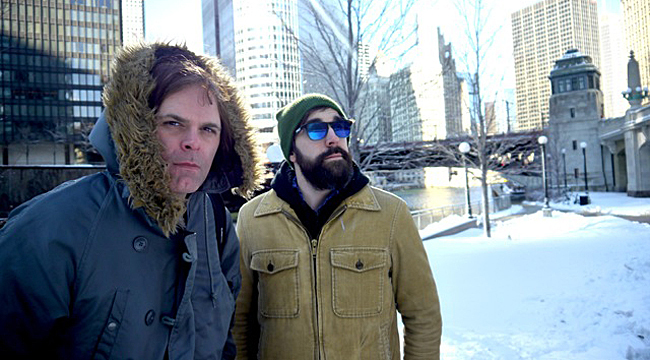 With 1996’s As Good As Dead, Local H delivered a radio hit with the Nirvana-like tune “Bound for the Floor.” Now, in the wake of its newest album, Hey, Killer, the band has embarked on a tour celebrating its 25th anniversary. Singer-guitarist Scott Lucas spoke to us via phone about the band’s legacy. What do you remember of your first-ever live performance at the University of Wisconsin in April of 1990? It was Earth Day. The band was a four-piece then. It was definitely a college show at the quad, or whatever they called it. We had some songs and it was pretty inauspicious. It wasn’t a huge, earth-shattering deal. Did you think the band would be around for 25 years? I don’t know. I have no idea what I thought. I know I always wanted to play music. I probably didn’t think I’d be doing anything else. Did you have a specific inspiration? I think that for me, starting to form bands was a way to play music that I was writing. That was the main point. I wanted to do that stuff live in front of people and flesh out the music that was in my head. That was the main reason for my even learning to play guitar. I just wanted to write songs. It’s always been about serving the song. But was there specific music you liked? Our guitar player was a major Replacements fan. I was a major R.E.M. fan. There was a lot of that going on. Our bass player was a dyed-in-the-wool punk. It was coming from different ’80s underground American music. On one end of the spectrum, there was R.E.M. and on the other was 7 Seconds. Joe [Daniels] was a fantastic drummer. Talk about the time you spent with him. We started playing together in high school. I couldn’t find anyone else in my hometown that I agreed with. You fall away from each other and find yourself playing together again. Ham Fisted came out in 1995. Did you release anything prior to that? The first thing that came out was a 7-inch EP and the other things were cassette releases. That was pretty much it. All that time was spent trying to figure out what we should sound like and what kind of band we wanted to be. When the band started as a four-piece and the other guitar play quit, we had to figure out how to go from four to three and then from three to two. There was a time of not playing live but recording and trying to find someone to fill in on bass. But then we decided we just wanted to do it as a two-piece. At the time, there weren’t a lot of two-pieces and there weren’t any heavy two-pieces as far as we know. That was a big hurdle – to figure out how to make heavy rock as a duo. I was in a punk band in high school and we didn’t have a bass player. Bands like Chickasaw Mudd Puppies and Flat Duo Jets were blues-based bands. Even today, most of the bigger two-piece bands like White Stripes and the Black Keys are blues-based. It lends himself well to that and not as much to heavy rock. We had cassette release and demos we had been making. Somebody heard a demo. We hadn’t played live yet but they didn’t know that. They wanted to come see us play so we booked a show real quick. That was the first time we ever played as a two-piece and it was out of necessity. We didn’t want to tell them that we weren’t ready. “Bound for the Floor” became your biggest hit. Do you still enjoy playing the tune? Sometimes. If we don’t, we just don’t play it. It’s not a huge deal either way. Talk about how Brian St. Clair joined the band. I met Brian in Triple Fast Action. We had gone on tour with them quite a few times. When they lost their guitar player I subbed and filled in. It was definitely a thing where we clicked musically. There really wasn’t anybody else that I was thinking about when I needed to find another drummer. It was a no-brainer. He worked as Cheap Trick’s drum tech. Did he have good stories? We all do. We all have good stories about Cheap Trick. It was a matter of those guys being around. Every time you were in their orbit, something funny would happen or they would do something to make fun of you. How did you find your new drummer, Ryan Harding? Again, that was a thing where it was a no-brainer. We had played and toured together in bands. I clicked pretty well with him and when something happened, I knew I had that thing in our back pocket. I knew where to go and that was an easy transition. Talk about the forthcoming album Hey, Killer. You only had two songs written when you booked the studio session? We spent this entire year just touring. Instead of just recording right away, we got tighter. We would collect riffs and tour. Then we recorded an EP last March. We went on tour with that EP and kept playing. Ryan had been in the band for almost a year and it was time to make a record. We wanted to get it out by the spring. We booked time in the studio in December. Then, I realized we were in a bind. There were a few ideas but no real songs. I got panicked and I went on a getaway for a couple of days. I started listening to the voice memos on my phone and realized we had a lot of ideas there. There were about 20 ideas for songs that were really good. It was surprising how many things that had been there waiting to happen. I went to the Fun Fun Fun Fest in Austin. I missed all the festivals in Chicago because we were on tour. I wanted to go see these bands. At festivals, you see a lot of good things and it inspires you. We worked with Andy Gerber, who we’ve worked with on and off for years. Greg Norman, an engineer, worked on it. I had worked on a Married Men record with him before. It was great. You get to work on the record and you look at each other and think, “Is it just me or is this record really good?” It really came together. It was good feeling. The music industry has changed so much. If the group just started playing in 2015, would it last for 25 years? Probably. Who knows? There’s no way to know an answer to a question like that. I would assume if I was 20 years younger, I would still be a hard-headed prick. To me, that accounts for the longevity as much as anything. It’s just wanting to do it and not giving up. Arlington Heights, IL – H.O.M.E.